RIPPED FREAK® PRE-WORKOUT is the strongest and most concentrated pre-workout powder ever developed! RIPPED FREAK® PRE-WORKOUT is stronger than anything because it’s concentrated with the HIGHEST percentage of ACTIVE ingredients of all pre-workout products on the market! In addition, RIPPED FREAK® PRE-WORKOUT contains new, never-before-seen ingredients that will crank your intensity, energy and strength into overdrive! 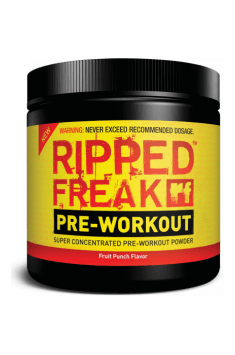 Why is RIPPED FREAK® PRE-WORKOUT better than every other pre-workout powder? RIPPED FREAK® PRE-WORKOUT contains the most powerful combination of adrenaline-enhancing ingredients ever used in a pre-workout product! RIPPED FREAK® is the ONLY pre-workout product that uses a clinically-proven dose of TyroPure™ Instantized L-Tyrosine for maximum mental alertness and cognitive function. The clinically-proven dose of TyroPure™ Instantized L-Tyrosine found in RIPPED FREAK® PRE-WORKOUT dramatically amplifies the adrenaline-stimulating effects of its formula! With this ingredient combination, you'll maximize your energy and intensity levels AND experience better mental focus and clarity all at the same time! RIPPED FREAK® PRE-WORKOUT is the ONLY pre-workout product on the market to include AstraGin™, which is a clinically-proven absorption enhancer. With AstraGin in its formula, RIPPED FREAK® PRE-WORKOUT has better bioavailability of its ingredients and is therefore able to deliver more powerful effects than all other concentrated pre-workout powders. Why do you need RIPPED FREAK® PRE-WORKOUT? RIPPED FREAK® PRE-WORKOUT will crank up your energy, intensity and mental focus for greater strength and overall performance! When the adrenaline-enhancing ingredients are combined with the clinically-proven dosage of TyroPure™ L-Tyrosine found in RIPPED FREAK® PRE-WORKOUT, the stimulating effects are mind-altering! RIPPED FREAK® PRE-WORKOUT maximizes muscle pumps, strength, endurance and recovery by using the synergistic combination of Beta-Alanine and Arginine AKG. In a nutshell, the combination of Beta-Alanine and Arginine AKG ensures your muscles are primed for maximum pumps, performance, growth and recovery! RIPPED FREAK® PRE-WORKOUT has better absorption and bioavailability of its ingredients than every other pre-workout product on the market because it uses AstraGin™ – the clinically-proven absorption-enhancing agent. Essentially, AstraGin™ enhances the beneficial effects of all the other ingredients in RIPPED FREAK® PRE-WORKOUT. One portion should be used 30 minutes before training. To maintain high sensitivity to the product effects, avoid taking before every training or take breaks from time to time, at least once a week. Do not take during 5 hours before sleep to avoid sleep problems. PHARMA FREAK is producing sports supplements. The wide offer includes products like supplements with high-quality creatine and supplements that increase testosterone production. The product range are also include high efficiency fat burners, and gainers, which are considered as one of the most efficient on the market. Microcrystalline Cellulose, DiCalcium Phosphate, Stearic Acid, Croscarmellose Sodium, Gelatin, Magnesium Stearate, Silicone Dioxide, Hypromellose (USP 2910), Polyethylene Glycol (PEG 8000), Titanium Dioxide, Talc, Blue No. 1, Yellow No. 6.